I am giving here the list of new and updated packages extracted from my local tlmgr.log file, but I am having some doubts, the list seems in both cases a bit too long for me 😉 Anyway, it was a very busy month for TeX packages. We are also moving at high speed to TeX Live 2018. 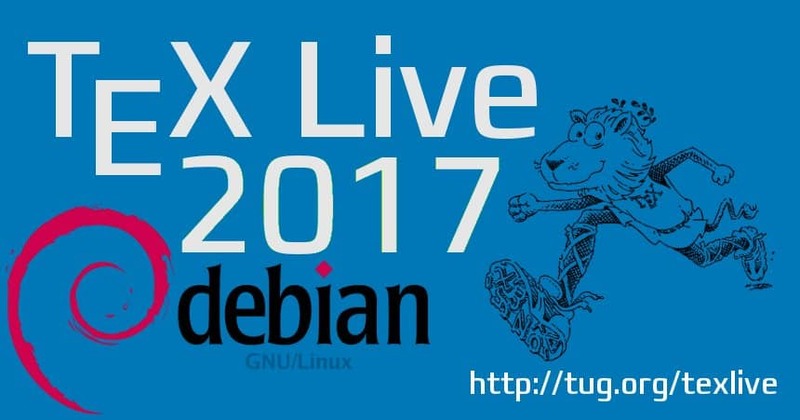 There will be probably one more release of Debian packages before we switch to the 2018 branch, which aligns nicely with the release planning of TeX Live. abnt, adigraph, algobox, algolrevived, aligned-overset, alkalami, amscls-doc, authorarchive, axodraw2, babel-azerbaijani, beamertheme-saintpetersburg, beilstein, bib2gls, biblatex-enc, biblatex-oxref, biochemistry-colors, blowup, bredzenie, bxcalc, bxjaprnind, bxorigcapt, bxtexlogo, cesenaexam, cheatsheet, childdoc, cje, cm-mf-extra-bold, cmsrb, coelacanth, collection-plaingeneric, combofont, context-handlecsv, crossreftools, ctan-o-mat, currency, dejavu-otf, dijkstra, draftfigure, ducksay, dviinfox, dynkin-diagrams, endofproofwd, eqnnumwarn, fancyhandout, fetchcls, fixjfm, fontawesome5, fontloader-luaotfload, forms16be, glossaries-finnish, gotoh, graphicxpsd, gridslides, hackthefootline, hagenberg-thesis, hecthese, hithesis, hlist, hyphen-belarusian, ifptex, ifxptex, invoice2, isopt, istgame, jfmutil, knowledge, komacv-rg, ku-template, labelschanged, ladder, latex-mr, latex-refsheet, lccaps, limecv, llncsconf, luapackageloader, lyluatex, maker, marginfit, mathfam256, mathfixs, mcexam, mensa-tex, modernposter, modular, mptrees, multilang, musicography, na-box, na-position, niceframe-type1, nicematrix, notestex, numnameru, octave, outlining, pdfprivacy, pdfreview, pixelart, plex, plex-otf, pm-isomath, poetry, polexpr, pst-antiprism, pst-calculate, pst-dart, pst-geometrictools, pst-poker, pst-rputover, pst-spinner, pst-vehicle, pxufont, rutitlepage, scientific-thesis-cover, scratch, scratchx, sectionbreak, sesstime, sexam, shobhika, short-math-guide, simpleinvoice, simplekv, spark-otf, spark-otf-fonts, spectralsequences, stealcaps, termcal-de, textualicomma, thaienum, thaispec, theatre, thesis-gwu, tikz-feynhand, tikz-karnaugh, tikz-ladder, tikz-layers, tikz-relay, tikz-sfc, tikzcodeblocks, tikzducks, timbreicmc, translator, typewriter, typoaid, uhhassignment, unitn-bimrep, univie-ling, upzhkinsoku, wallcalendar, witharrows, xechangebar, xii-lat, xltabular, xsim, xurl, zebra-goodies, zhlipsum. ESIEEcv, FAQ-en, GS1, HA-prosper, IEEEconf, IEEEtran, MemoirChapStyles, academicons, achemso, acro, actuarialsymbol, adobemapping, afm2pl, aleph, algorithm2e, amiri, amscls, amsldoc-it, amsmath, amstex, amsthdoc-it, animate, aomart, apa6, appendixnumberbeamer, apxproof, arabi, arabluatex, arara, archaeologie, arsclassica, autosp, awesomebox, babel, babel-english, babel-french, babel-georgian, babel-hungarian, babel-latvian, babel-russian, babel-ukrainian, bangorcsthesis, bangorexam, baskervillef, bchart, beamer, beamerswitch, beebe, besjournals, beuron, bgteubner, biber, biblatex, biblatex-abnt, biblatex-anonymous, biblatex-apa, biblatex-archaeology, biblatex-arthistory-bonn, biblatex-bookinother, biblatex-cheatsheet, biblatex-chem, biblatex-chicago, biblatex-fiwi, biblatex-gb7714-2015, biblatex-gost, biblatex-iso690, biblatex-manuscripts-philology, biblatex-philosophy, biblatex-publist, biblatex-realauthor, biblatex-sbl, biblatex-shortfields, biblatex-source-division, biblatex-trad, biblatex-true-citepages-omit, bibleref, bibletext, bibtex, bibtexperllibs, bibtexu, bidi, bnumexpr, bookcover, bookhands, bpchem, br-lex, bxbase, bxjscls, bxnewfont, bxpapersize, bytefield, c90, callouts, calxxxx-yyyy, catechis, cbfonts-fd, ccicons, cdpbundl, cellspace, changebar, checkcites, chemfig, chemmacros, chemschemex, chet, chickenize, chktex, circuitikz, citeall, cjk-gs-integrate, cjkutils, classicthesis, cleveref, cm, cmexb, cmpj, cns, cochineal, collref, complexity, comprehensive, computational-complexity, context, context-filter, context-fullpage, context-letter, context-title, context-vim, contracard, cooking-units, correctmathalign, covington, cquthesis, crossrefware, cslatex, csplain, csquotes, css-colors, ctan-o-mat, ctanify, ctex, ctie, curves, cweb, cyrillic-bin, cyrplain, datatool, datetime2-bahasai, datetime2-german, datetime2-spanish, datetime2-ukrainian, dccpaper, dejavu-otf, delimset, detex, dnp, doclicense, docsurvey, dox, dozenal, drawmatrix, dtk, dtl, dvi2tty, dviasm, dvicopy, dvidvi, dviljk, dvipdfmx, dvipng, dvipos, dvips, e-french, easyformat, ebproof, eledmac, elements, elpres, elzcards, embrac, emisa, enotez, eplain, epstopdf, eqparbox, esami, etoc, etoolbox, europasscv, euxm, exam, expex, factura, fancyhdr, fancylabel, fbb, fei, feyn, fibeamer, fira, fithesis, fmtcount, fnspe, fontinst, fontname, fontools, fonts-tlwg, fontspec, fonttable, fontware, footnotehyper, forest, fvextra, genealogytree, genmisc, gfsdidot, glossaries, glossaries-extra, glyphlist, gost, graphbox, graphics, graphics-def, graphics-pln, gregoriotex, gsftopk, gtl, guide-to-latex, gustlib, gustprog, halloweenmath, handout, hepthesis, hobby, hvfloat, hvindex, hyperref, hyperxmp, hyph-utf8, hyphen-base, hyphen-churchslavonic, hyphen-german, hyphen-latin, ifluatex, ifplatform, ijsra, impatient-cn, inconsolata, ipaex, iscram, jadetex, japanese-otf, japanese-otf-uptex, jlreq, jmlr, jmn, jsclasses, kantlipsum, karnaugh-map, ketcindy, keyfloat, kluwer, koma-script, komacv, kpathsea, l3build, l3experimental, l3kernel, l3packages, lacheck, lambda, langsci, latex-bin, latex2e-help-texinfo, latex2e-help-texinfo-fr, latex2e-help-texinfo-spanish, latex2man, latex2nemeth, latexbug, latexconfig, latexdiff, latexindent, latexmk, lato, lcdftypetools, leadsheets, leipzig, lettre, libertine, libertinegc, libertinus, libertinust1math, limap, lion-msc, listofitems, lithuanian, lni, lollipop, lt3graph, lua-check-hyphen, lualatex-math, luamplib, luatex, luatexja, luatexko, luatodonotes, luaxml, lwarp, m-tx, macros2e, make4ht, makedtx, makeindex, mandi, manfnt-font, marginnote, markdown, math-into-latex-4, mathpunctspace, mathtools, mcf2graph, media9, metafont, metapost, mex, mfirstuc, mflua, mfnfss, mfware, mhchem, microtype, minted, mltex, morewrites, mpostinl, mptopdf, msu-thesis, multiexpand, musixtex, mwcls, mwe, nddiss, ndsu-thesis, newpx, newtx, newtxtt, nlctdoc, noto, novel, numspell, nwejm, oberdiek, ocgx2, omegaware, oplotsymbl, optidef, ot-tableau, otibet, overlays, overpic, pagecolor, patgen, pdflatexpicscale, pdfpages, pdftex, pdftools, pdfwin, pdfx, perfectcut, pgf, pgfgantt, pgfplots, phfqit, philokalia, phonenumbers, phonrule, pkgloader, placeat, platex, platex-tools, platexcheat, poemscol, polski, polynom, powerdot, prerex, presentations, preview, probsoln, program, ps2pk, pst-barcode, pst-cie, pst-circ, pst-dart, pst-eucl, pst-exa, pst-fit, pst-fractal, pst-func, pst-geo, pst-ghsb, pst-node, pst-ode, pst-ovl, pst-pdf, pst-pdgr, pst-plot, pst-pulley, pst-solarsystem, pst-solides3d, pst-tools, pst2pdf, pstool, pstools, pstricks, pstricks-add, psutils, ptex, ptex-base, ptex-fontmaps, ptex-fonts, ptex2pdf, pxbase, pxchfon, pxjahyper, pxrubrica, pythontex, qpxqtx, quran, ran_toks, randomlist, randomwalk, rec-thy, refenums, reledmac, repere, resphilosophica, revtex4, robustindex, roex, rubik, sasnrdisplay, screenplay-pkg, scsnowman, seetexk, siunitx, skak, skrapport, songs, spreadtab, srbook-mem, stage, struktex, svg, sympytexpackage, synctex, systeme, t1utils, tcolorbox, testidx, tetex, tex, tex-refs, tex4ebook, tex4ht, texconfig, texcount, texdef, texdirflatten, texdoc, texfot, texosquery, texshade, texsis, textgreek, texware, texworks, thalie, thesis-ekf, thuthesis, tie, tikz-kalender, tikz-timing, tikzmark, tikzpeople, tikzsymbols, tlcockpit, tlshell, tocloft, toptesi, tpic2pdftex, tqft, tracklang, translation-biblatex-de, translations, ttfutils, tudscr, tugboat, turabian-formatting, ucharclasses, udesoftec, ulthese, unfonts-core, unfonts-extra, unicode-data, unicode-math, uowthesistitlepage, updmap-map, uplatex, upmethodology, uptex-base, uptex-fonts, variablelm, varsfromjobname, velthuis, visualtikz, vlna, web, widetable, wordcount, xassoccnt, xcharter, xcjk2uni, xcntperchap, xdvi, xecjk, xepersian, xetex, xetexconfig, xetexko, xetexref, xgreek, xii, xindy, xint, xmltex, xmltexconfig, xpinyin, xsavebox, ycbook, yhmath, zhnumber, zxjatype.